A close-up view of the newly installed marker of the Davao City-University of the Philippines Sports Complex. Photo by Rene A. Estremera, UP Mindanao. 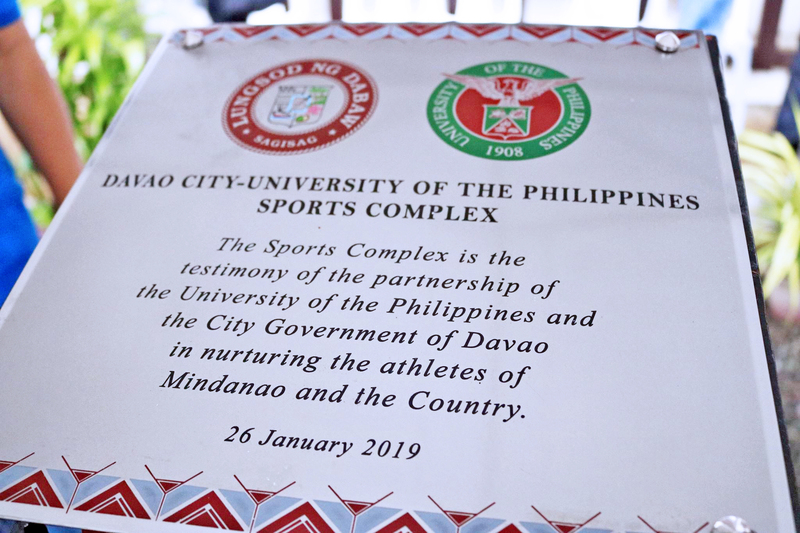 “The Sports Complex is the testimony of the partnership of the University of the Philippines and the City Government of Davao in nurturing the athletes of Mindanao and the Country.” These are the words on the marker that was unveiled at the Davao City-University of the Philippines Sports Complex on 26 January 2019. The unveiling of the marker was done by UP President Danilo Concepcion, Davao City Assistant City Administrator for Operations Atty. Lawrence Bantiding on behalf of Davao City Mayor Sara Duterte-Carpio, Davao City 3rd District Congressman Alberto Ungab, former congressman Isidro Ungab, and UP Mindanao Chancellor Sylvia Concepcion. Davao City 3rd District Congressman Alberto Ungab, in his remarks, introduced Davao City and its 3rd District, in particular, for the benefit of the visitors. Former congressman Isidro Ungab declared that he was “the happiest person in the gathering” for having seen the sports complex project from its beginnings in 1995 up to the present, whereof he narrated the highlights. President Danilo Concepcion, for his part, said he considered himself “the most fortunate person in the gathering” for having the benefits of the efforts of the former congressman for UP “fall like the rain” during his own term. Chancellor Concepcion, in her welcome remarks, introduced the UP officials present and thanked the Department of Public Works and Highways, Philippine Sports Commission, Presidential Commission for the Urban Poor, and the UP Mindanao Campus Planning and Development Office. 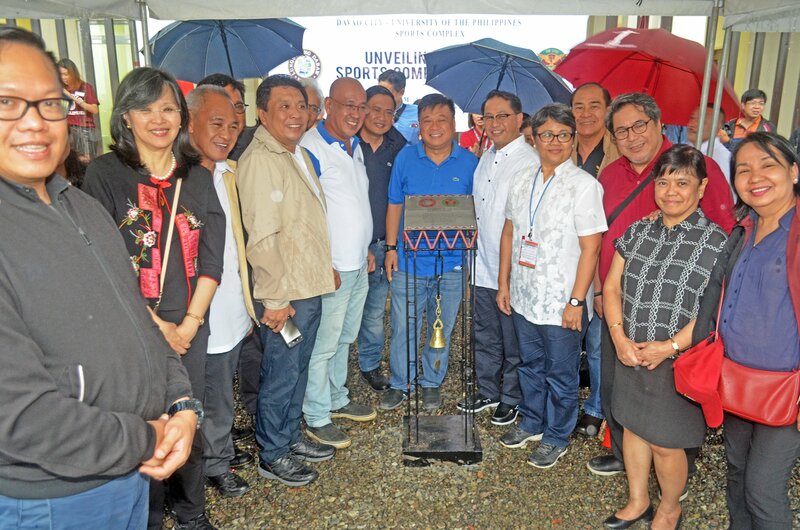 The Unveiling of the DC-UP Sports Complex Marker was attended by (left-right) UP VP for Planning and Finance Joselito Florendo, UP Manila Chancellor Carmencita Padilla, UP VP for Administration Nestor Yunque, UP Mindanao Dean Larry Digal (behind), UP Los Baños Chancellor Fernando Sanchez Jr., UP Visayas Chancellor Ricardo Babaran (behind), Congressman Alberto Ungab, Asst. City Administrator Atty. Lawrence Bantiding, Hon. Isidro Ungab, UP President Danilo L. Concepcion, UP Mindanao Chancellor Sylvia Concepcion, Francisco “Bobby” Ramos, UP EVP Teodoro Herbosa, UP VP for Development Elvira Zamora, UP Open University Chancellor Melinda Bandalaria. Photo by Rene A. Estremera, UP Mindanao. Among the guests who attended from UP were Regent Angelo Jimenez, Regent Analiza Fulvadora, Executive Vice-President Teodoro Herbosa, VP for Administration Nestor Yunque, VP for Development Elvira Zamora, VP for Planning and Finance Joselito Florendo, UP Manila Chancellor Carmencita Padilla, UP Open University Chancellor Melinda Bandalaria, UP Visayas Chancellor Ricardo Babaran, UP Los Baños Chancellor Fernando Sanchez, Jr., and Padayon Director Jeanette Yasol-Naval representing VP for Public Affairs Elena Pernia.